I probably should have written that down…. I have this nasty habit of just throwing stuff together and hoping for the best. And then when whatever I’ve thrown together comes out delicious, I have no idea what I did. I am slowly learning my lesson when it comes to cooking, but baking? Well baking shouldn’t be improvised.. or so they say. A few months ago, I made a sourdough starter with the intention of making whole wheat sourdough bread, and I followed the method in my Whole Grain Bread book to the letter. 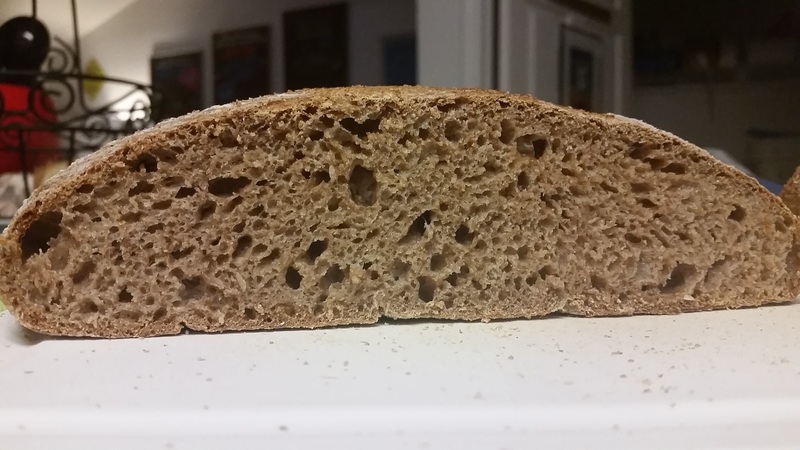 I measured the starter, I started the “soaker” which is basically water and flour mixed up so that the bitter elements in the whole wheat flour and… I added the commercial yeast per the instructions. The bread was… good. I mean it was fine. We enjoyed it. It was certainly better than any 100% whole wheat bread purchased in the store. And it sure looked pretty. Mostly, I was happy with it. But I really wanted a 100% whole wheat flour sourdough with no commercial yeast added. And then I stuck the sour in the fridge and forgot about it for a month. In the meantime, while searching for my tried and true recipe for Chicken Tortilla Soup (which I didn’t find) I stumbled across the handouts that I got from Chef Krebs at SCCC when I took a course on making sourdough at home. HUZZAH! No commercial yeast! And more information that I had forgotten about. So.. um.. I took the sour out of the fridge, fed it twice by eye, shoved some sour back in a jar and basically, added salt based on the formulas on the handouts (mostly I did the math based on the weight of my sour), proofed it, shaped it, panned it and baked it off. What was the worst that would happen? The sour needed to be fed and brought back to life anyway so, nothing ventured, nothing gained AMIRITE? You guys.. this was.. AMAZING. The FLAVOR of the sour was so pronounced and the texture was definately softer. I didn’t really knead this so much as fold it a few times every 30 minutes while it was proofing.. and I think I proofed it for 2 and a half hours..
My half-assed notes well after the fact. Since that was SO ridiculous, I decided that I was going to start taking better notes from my experiments. I’m going to file all of them here on this blog under The Bread Chronicles.